Adjust the rack in your oven to the middle position and preheat oven to 350 degrees. Rinse and scrub each potato under cold running water. Dry each potato thoroughly with a clean paper towel. Pierce each potato deeply with a fork several times. This will allow steam to escape during the baking. If you don't pierce the potatoes, they may explode during baking in your oven. I've had them explode in the microwave before. Rub the outside of the potato with olive oil over the skins. Sprinkle on salt on all sides. Bake on cookie sheet until tender. Approximately an hour for a medium size potato. Turn the potatoes over halfway through the baking time. You'll know it's done when you can jab at it with a fork and it goes in easily. Remove potatoes from the oven. Slit across the top with a sharp knife. Gently squeeze in each end of the potato towards the middle (using your thumb and index finger). Serve with your favorite toppings. The choices are limitless. A few examples are: butter, sour cream, chives, ham, broccoli and cheese sauce, or chili-cheese sauce (coming soon! ), and sour cream. Thanks so much for this reminder. I am baking 40 baked potatoes this Thursday to help feed my son's high school football team their pregame meal. I am just hoping I can get all of them in the oven at the same time. If you can't you can always bake and then put into hot crock pots to keep warm! It does look perfect! 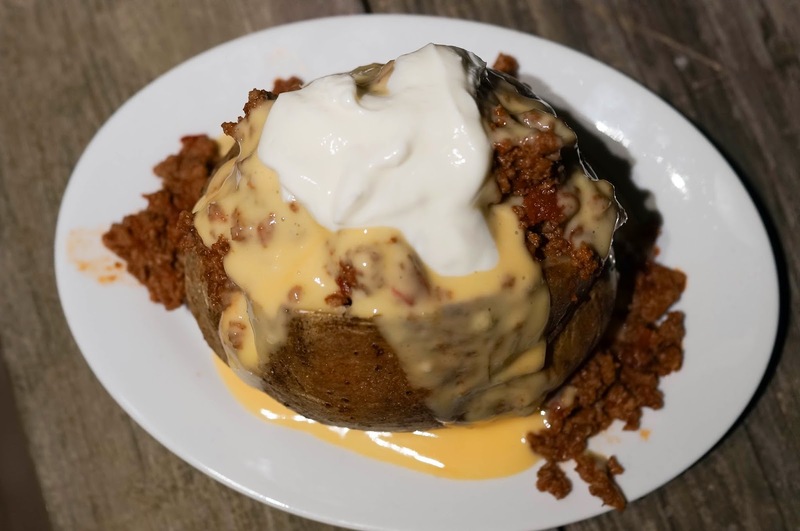 I love me a good baked potato! Thanks for sharing your tips! I'll be trying them out next time. oh yum! I always have trouble... thanks for sharing, I'll have to give it a try! Now I want one right NOW. Love baked potatoes. Olive oil? Turning it over? I have learned a lot from this post! That looks so good. Honestly I needed this because I can't make a bake potato but i love them. So thank you for sharing. My goodness, I LOVE potatoes. And I rarely bake them. These look amazing. I would take any leftovers you have to send my way. Thank you for not wrapping in foil!! My husband and I argue about the right way to bake potatoes and I've anti foil since the skin doesn't get crispy that way!